The art of deception and the big con job are at the center of ‘Focus‘, which is a very sleek film full of charm, wit, and a giant basket of twists and turns that will have you yelling in your seat. 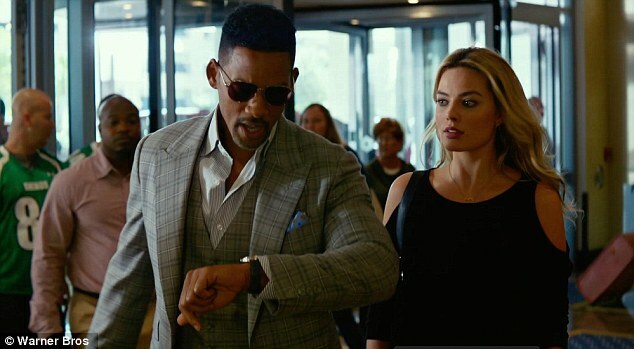 There isn’t anything relatively new or fresh here in the form of changing the game or genre of the ‘con-artist’ film, but with Will Smith and Margot Robbie’s performances and the luxurious and glossy look this film has, this deceptive film has a place of its own with the rest of the fun thief movies we’ve seen. Whether it be ‘Ocean’s 11‘, ‘Confidence‘, or even ‘Dirty Rotten Scoundrels‘, you can bet that you won’t see at least a few cons running full force at you. Instead, the story sneaks up behind you, gives you a thrill followed by a smile. And that’s what’s fun about these types of films. Yes, these are bad guys who steal from regular people every day, whether it be your credit cards, jewelry, or wallets. We’ve all gone through the hassle of canceling credit cards or having to replace stolen goods at some point in time. But with characters like Nicky and Jess (Will Smith and Margot Robbie) or Danny Ocean and Rusty Ryan (George Clooney and Brad Pitt from ‘Ocean’s 11‘), you can’t help but want to be a part of their team. Hell, you even root for them to steal and get away with it. It’s their charm and humor that you’re attracted to. Well that and the fun parties they have when the job is done and the amount of money they make. Smith plays Nicky, a con man who has been stealing by sleight-of-hand from people in public places for many years. He’s a pro who within five seconds have your watch, ring, and wallet in his possession without you knowing about it. He meets Jess (Robbie) at a restaurant who tries to con him, but Nicky can see it coming from a mile away. He calls her on it, but instead of walking away, he takes a liking to her and wants to train her to be a part of his team, which actually consists of a few dozen people, working together to steal as many wallets, pieces of jewelry, and credit cards as they can from your average joe’s walking down the street. The entire crew, led by Nicky end up in New Orleans for the big Superbowl game, where tourists and fans of football have flocked with all their hard earned cash. Over the course of the weekend, Nicky and Jess, along with several others rack up a couple of million dollars in stolen goods, which is shot very well over a few montage scenes. But it’s when Nicky takes Jess to the actual game where Nicky starts to place bets on the Superbowl with a flamboyant wealthy man named Liyuan, played by an impressive BD Wong, where things start to go sour. In a strange time jump, we fast forward three years to find Nicky in Buenos Aires, working a con on a wealthy man you owns some Formula One cars and racers named Garriga (Rodrigo Santoro). But Nicky’s world is turned upside down when he sees Jess again, whom he hasn’t seen since New Orleans, and things start to spiral out of control quickly for Nicky due to Garriga’s jerk of a partner Owens (Gerald McRaney). Writer-director’s Glenn Ficarra and John Requa have done a wonderful job here in telling a highly entertaining film that keeps you guessing and having fun from start to finish. Their script is not only very suspenseful at times, but is also quite hilarious. Ficarra and Requa wrote ‘Bad Santa‘ back in 2003 and directed ‘I Love You Phillip Morris‘ with Jim Carrey back in 2009, so you can see they have some skill in the humor department. As far as Will Smith and Margot Robbie go, they are both excellent here. Smith, as always, is quite the likable and appealing character without any of the melodramatic baggage this time. He’s quick, funny, and mysterious. He’s done one hell of a job here. And Robbie turns in another solid performance, delivering on every level, even if her character doesn’t get the chance to shine as much as Smith’s character does. ‘Focus‘ is a fun-as-hell film with great performances and some solid twists and turns. I look forward to a sequel, which I hope there is. This entry was posted on Thursday, February 26th, 2015 at 9:26 am	and is filed under Film, News. You can follow any responses to this entry through the RSS 2.0 feed. You can skip to the end and leave a response. Pinging is currently not allowed. « Scream Factory Brings ‘Carrie’ and ‘The Rage: Carrie 2’ To Blu-ray!! !